Contributing to a string of stories about questionable business practices by "big business hospice" is the Huffington Post article "Hospice, Inc." of June 19, 2014. This and other articles, such as a June 26, 2014 article in the Washington Post, all tell a story, but they do not tell the story. It's deeply disappointing when these unfortunate experiences receive national exposure that casts a shadow on the overwhelmingly positive value and service hospice care brings to individuals, to their families, and to the healthcare system. Without argument, there are instances of overly-aggressive marketing, unsound business practices, and other issues in hospice, but national data strongly suggest these are the exceptions and not the rule. According to current data received directly from over 36,000 family members that completed a standardized 56+ item evaluation of care survey, and reported by Strategic Healthcare Programs' (SHP) national hospice benchmark database, over 70% of families rate the care the patient received as "Excellent". Families said that hospices provided the right amount of emotional support before and after the patient's death 94% and 91% of the time, respectively. Quality of care is also rated high, with families saying that hospices provide "just the right" amount of medication, help with breathing, and help with anxiety and sadness 95%, 94%, and 90% of the time, respectively. While the Huffington Post article highlighted some national statistics showing that patients are spending a longer time in hospice, a deeper look into the numbers reveals that almost half of terminally ill patients (48.5%) enter hospice within the last two weeks of their lives. 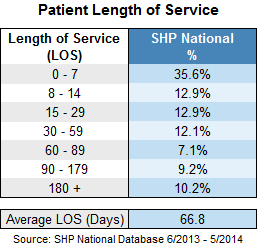 61.4% of patients are on service less than 30 days, and 35.6% are on service less than eight days. In other words, almost two-thirds of patients are not entering hospice soon enough. The last six months of life can also be very expensive, and hospice helps reduce the financial burden on families and on society. Most of a person's healthcare costs are spent in the last few months of life, and those costs come not from hospice, but from inpatient hospital care. In a landmark study conducted by Duke University in 2007, the authors found that hospice reduced Medicare costs by an average of $2,309 per hospice patient, and that figure is likely higher now. The study found that Medicare costs would be reduced for seven out of ten hospice recipients if hospice had been used for a longer period of time. "Given that hospice has been widely demonstrated to improve quality of life of patients and families…the Medicare program appears to have a [perfect] situation whereby something that improves quality of life also appears to reduce costs," writes lead author Don H. Taylor, Jr., assistant professor of public policy at Duke's Sanford Institute of Public Policy. In a follow-up study by Amy S. Kelley, MD, MSHS, from the Brookdale Department of Geriatrics and Palliative Medicine at the Icahn School of Medicine at Mt. Sinai and published in the March 2013 issue of Health Affairs, the authors suggest that investment in the Medicare Hospice Benefit translates into savings overall for the Medicare system. "If 1,000 additional beneficiaries enrolled in hospice 15 to 30 days prior to death, Medicare could save more than $6.4 million," they note. The study also reveals that savings to Medicare are present for both cancer patients and non-cancer patients. Moreover, these savings appear to grow as the period of hospice enrollment lengthens with the observed study period of one to 105 days. To bring public transparency to hospice care, the Centers for Medicare and Medicaid Services (CMS) has recently mandated a national hospice quality reporting program, HQRP, that if not complied with results in a 2% reduction in reimbursement. The new hospice measures, known as the Hospice Item Set (HIS), will begin July 1, 2014, and will cover processes of care essential to hospice. Next year, a new family evaluation of care survey will also be mandated, and scores and benchmarks will be made publicly available. On June 23, 2014, David Casarett, a physician actively involved in hospice care, authored a response to the Huffington Post article, suggesting that consumers ask 15 key questions when shopping for the best hospice service in their area. One of those questions is "Do you measure and improve the quality of care that you provide to your patients?" He cautions that any hospice that doesn't have a quick and clear answer for this question probably isn't serious about patient care, and we agree. There are thousands of hospices that have been measuring quality data for decades, even before the recently mandated Centers for Medicare & Medicaid Services (CMS) Hospice Item Set (HIS), and they will be able to easily answer this question. Soon, consumers will also be able to compare quality scores on their own using the CMS website. The National Association for Home Care and Hospice (NAHC) has long called for more frequent inspections or surveys of hospices. Read their response here. The last six months of a terminally ill person's life are too often filled with physical and emotional distress for the patient and family, as well as significant financial and personal burdens. Hospice care — well-known and widely accepted in Europe, dating back to the 11th Century, and growing in the US — brings compassion and dignity to patients and families, provides physical and emotional comfort. Our country would do well to identify appropriate patients and admit them to hospice sooner in an effort to reduce costs to our healthcare system. The value, success, and personal impact of hospice care will not make headlines as readily as the tragic cases, but hospices will continue to do what they have been doing for centuries — provide comfort and support to those nearing the end of life and to those who love them. Barbara Rosenblum is the Founder and CEO of Strategic Healthcare Programs, Santa Barbara, California. This article first appeared in "Barbara's Blog" .